Economy Badge Reel, Pin-On -Gray - 100 pack - This Economy Badge Reel will help you display your ID badges with ease. To use in hospitals, schools, offices or any where you want easy access to your companies ID badge. Easy to attach and add to your ID badge your perfect way to inexpensively display your badge. To Pin on any material for ease of use. No pockets necessary. Economy Badge Reel, Pin-On - Gray - 100 pack - This Economy Badge Reel will help you display your ID badges with ease. 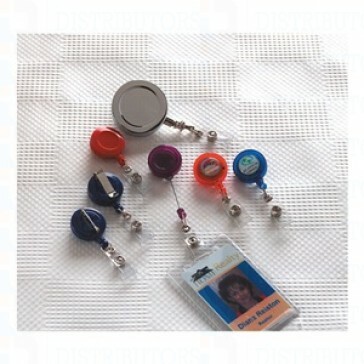 To use in hospitals, schools, offices or any where you want easy access to your companies ID badge. Easy to attach and add to your ID badge your perfect way to inexpensively display your badge. To Pin on any material for ease of use. No pockets necessary.